When it comes to packing a whole lot of skiing options into one trip, there’s no better vacation destination than Colorado’s I-70 corridor. It’s home to dozens of ski areas, and thanks to the Epic Pass, families can visit all four Vail resorts within two hours of Denver on a single trip. 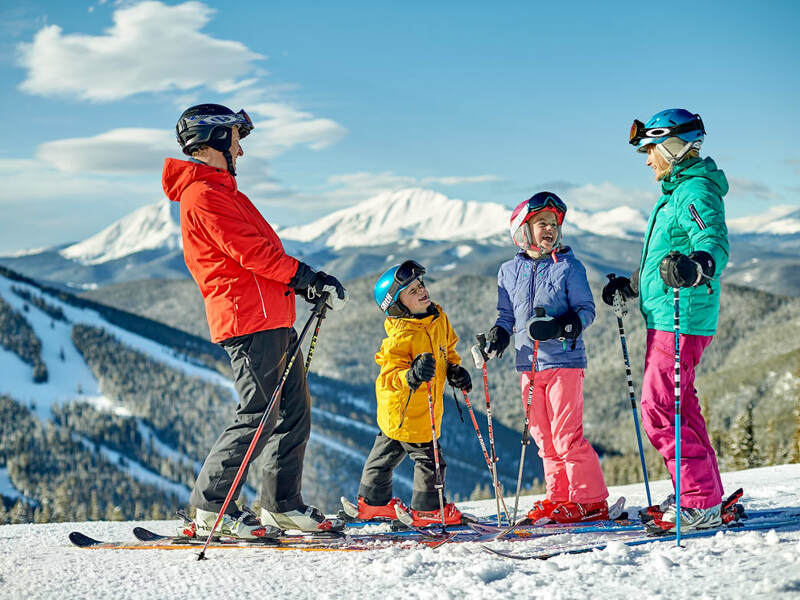 Like all Vail resorts, Breckenridge, Keystone, Vail, and Beaver Creek each balance more advanced terrain with family-friendly activities and beginner terrain. All four feature the light, champagne powder snow Colorado is known for, helpful instructors and daycare centers, and plenty of off-slope activities that are fun for all ages. So what sets them apart? Here’s what makes each resort a unique and worthwhile stop on your winter getaway. 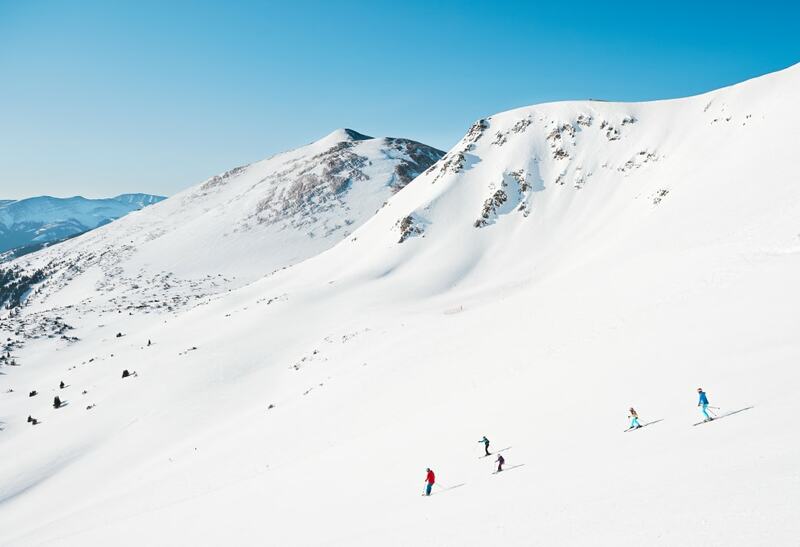 Located 104 miles from Denver, Breckenridge is a great ski resort for families in North America thanks to its wide, well-groomed trails, gentle green terrain, and seemingly endless blue runs for intermediates. It is by no means a small resort, coming in at 3,000 acres of skiable terrain and featuring 187 trails. Another bonus is the designated family learning zones, magic carpet lifts, and runs designated for first-time skiers and riders. Even though it’s a smaller resort, there is a ton of family fun to be had off the ski hill as well. The base of the mountain is located right in town, meaning that it has slightly more amenities than your average ski village. There’s a daycare center, a sled hill, nearby tubing, cross-country skiing, snowmobiling, ice skating, and horse-drawn carriage rides. There’s also an indoor climbing center located right in town. And when your family needs a break from all that physical activity, the town of Breckenridge is a historic mining town that also features shopping, restaurants, and plenty of places for the little ones to explore. 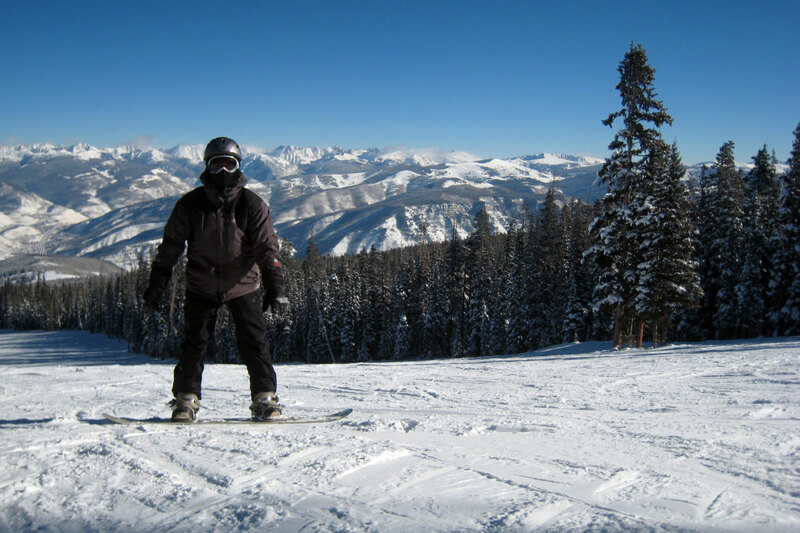 Keystone is about 99 miles from Denver and also features more than 3,000 acres of skiable terrain. It’s known as one of the most popular ski resorts for families in Colorado and is perfect resort for rambunctious kids thanks to its ski and board school, three terrain parks, five bowls, tubing, ice-skating, and more. 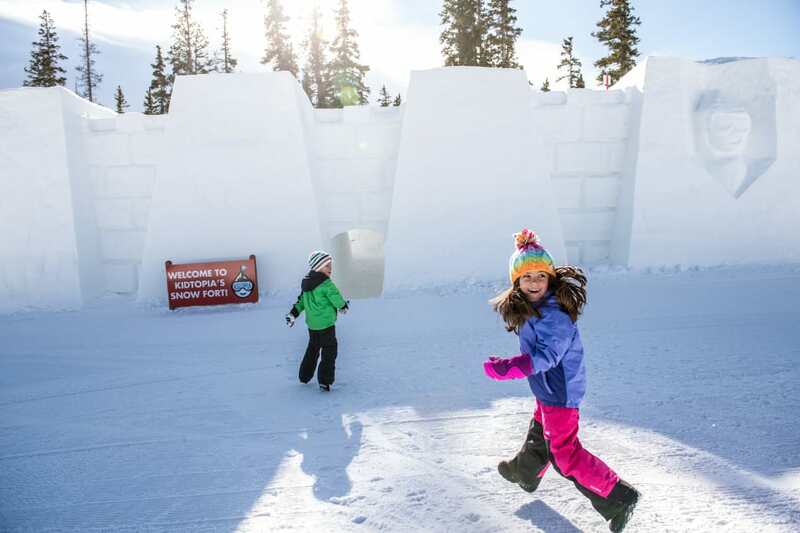 It’s also home to the world’s largest snow fort and Kidtopia—an impressive winter playground with giant legos, foosball, arts and crafts, and way more fun than a single family can handle. 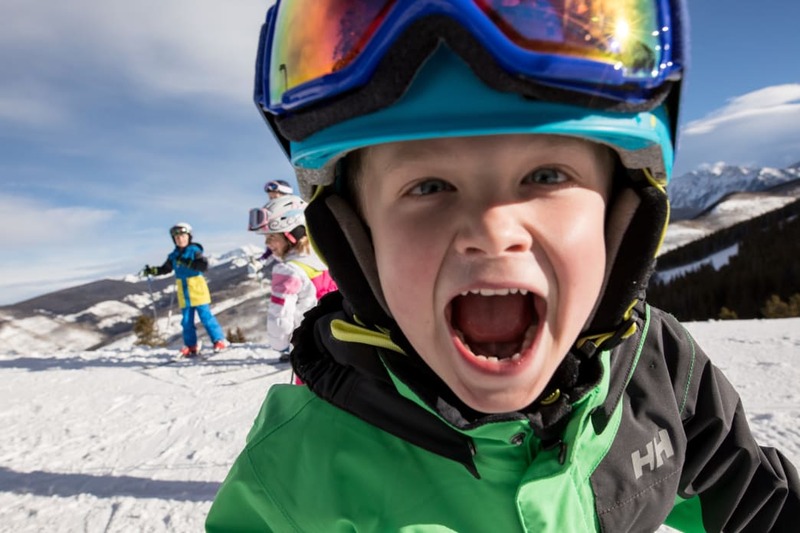 The resort’s perks include free skiing for kids when their families book lodging onsite, daycare (parents are asked to supervise their kids at Kidtopia), goofy events for the whole family to attend, a Nordic center, and night skiing. But don’t worry, thrillseekers—Keystone has something for you, too! The resort is consistently among the nation’s top-ranked resorts when it comes to terrain parks. The A51 zone offers 60 acres of terrain park with more than 100 features and sets this resort apart from others on this list. Vail is huge, coming in at more than 5,000 skiable acres and offering something for every skill level. Its family-friendly terrain includes gentle beginner slopes that have room for newbies to practice pizza turns and french fries as well as slow zones designated for learning. The resort’s signature attractions are the deep, powder-filled bowls where more advanced skiers and riders will flock in droves on a good snow day. At Vail, non-skiers can ride the gondola up to Adventure Ridge to enjoy other winter sports like ski biking, a mountain coaster, snowmobiling for all ages, snowshoeing, and tubing. The village areas (there are actually three) feature daycare, ice skating, playgrounds, and plenty of family-friendly restaurants. Parents love the ski valet so they don’t have to schlep the family’s gear up and down the mountain. Vail is fancier than Keystone and Breckenridge, but it still maintains a carefree and family-fun approach to nearly all events and activities. Another bonus? The sheer size of this popular resort helps disperse crowds, making you feel a little more relaxed even though it’s one of the top ski vacation destinations in the world. 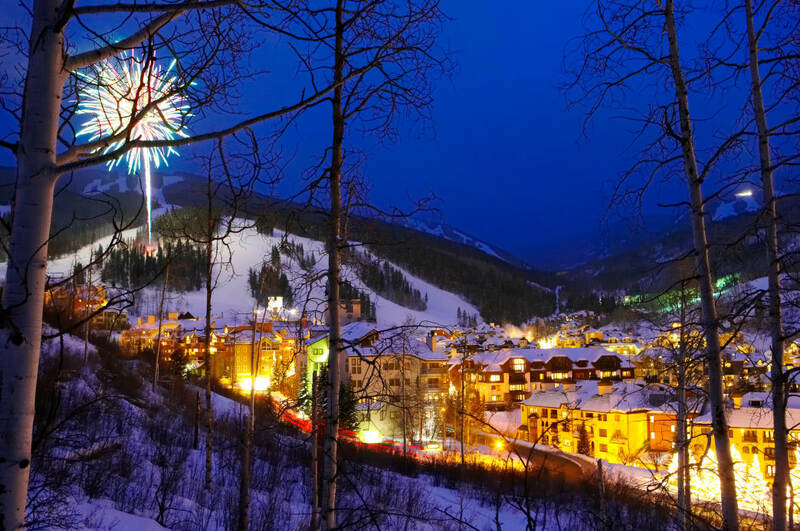 As the smallest Vail resort on the I-70 corridor at 1,800 skiable acres and 150 trails, Beaver Creek is also the most upscale. They are continually grooming runs that meander through groves of aspen trees—600 acres daily to offer the smoothest ride down for all skill levels. Beaver Creek is also known for its short lift lines and fast lifts. The village provides fewer activities and kid-friendly events overall, but a major perk that’s loved by anyone with a sweet tooth is the free, warm cookies they offer at the end of the day. You can also expect a lovely ice rink, fire pits, helpful employees, weekend fireworks, casual and fine dining, and a performing arts center. While each of the resorts along I-70 has its own personality, you can’t go wrong. Come find out for yourself why Colorado attracts skiers and snowboarders from around the world to enjoy the beauty of the Rockies in the winter.